Packed with bright Italian flavors, this rich and creamy pasta bake makes a delicious dish for weeknight dinners or easy entertaining. Preheat oven to 400°F. Cook ravioli according to package directions, adding 2 tbsp chicken base to cooking water; drain well, reserving 1/2 cup cooking water. Meanwhile, pat chicken dry with paper towel. Toss chicken with 1 tsp chicken base. 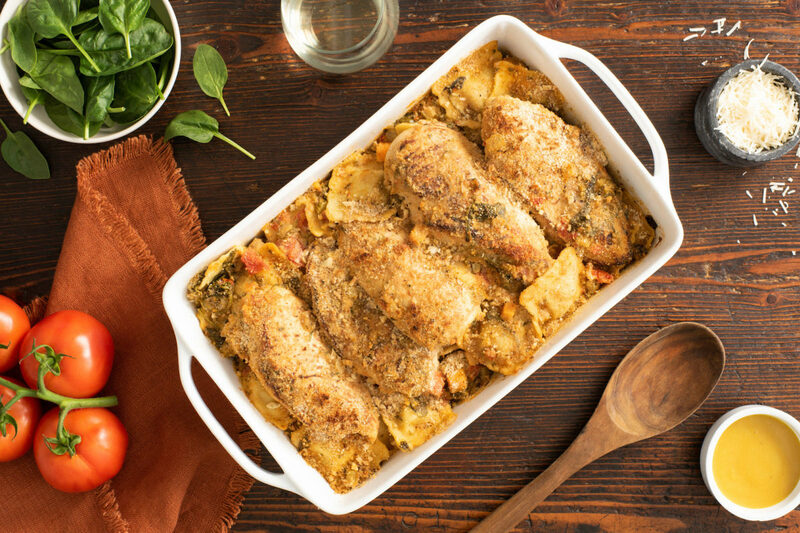 Heat 2 tbsp oil in large ovenproof skillet; cook chicken for 2 to 3 minutes per side or until browned. Transfer to plate. Heat 1 tbsp oil in same skillet; cook mushrooms for about 5 minutes or until starting to brown. Stir in remaining chicken base, onion, celery, carrot, half of the garlic, sun-dried tomatoes, sage and pepper. Cook for 3 to 5 minutes or until vegetables start to soften. Stir in wine and bring to boil. Cook for about 2 minutes or until liquid is slightly reduced. Stir in cream and diced tomatoes; return to boil. Reduce heat to medium-low. Simmer for 8 minutes. Add reserved ravioli and cooking water, spinach, Parmesan and basil, tossing until well coated. Transfer mixture to greased 13- x 9-inch baking dish. Nestle chicken into pan. Stir together bread crumbs, remaining oil and garlic, parsley and oregano. Sprinkle over top of casserole; bake for 16 to 18 minutes or until golden brown and bubbling.